The Shire of Nillumbik is located less than 25 kilometres north-east of Melbourne, and has the Yarra River as its southern boundary. It extends 29 kilometres to Kinglake National Park in the north. The Shire stretches approximately 20 kilometres from the Plenty River and Yan Yean Road in the west to Christmas Hills and the Yarra escarpment in the east. The Shire covers an area of 431.94 square kilometres and has an estimated population of 64,219 who live in close-knit communities which range from typical urban settings to remote and tranquil bush properties. There is also over 300 hectares of nature and recreation reserves, which does not include some areas of the Kinglake National Park in the north of the Shire. Nillumbik Shire Council holds an important Visual Art Collection of over 400 works of art of contemporary and historical interest. The focus of the collection is on works of excellence that reference local content or are works of excellence from artists who live locally. 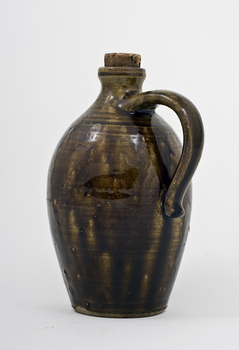 Some notable artists represented within the Collection are Clifton Pugh, Rick Amor, Deborah Halpern, Matcham Skipper, John Young, David Wadelton, Walter Withers, Sue Ford, Adriane Strampp and George Baldessin. 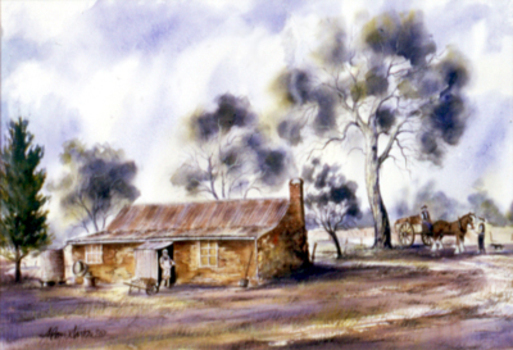 Nillumbik Shire Council also holds a Memorabilia and Public Art Collection with sixteen sculptures located in various public places throughout the Shire. 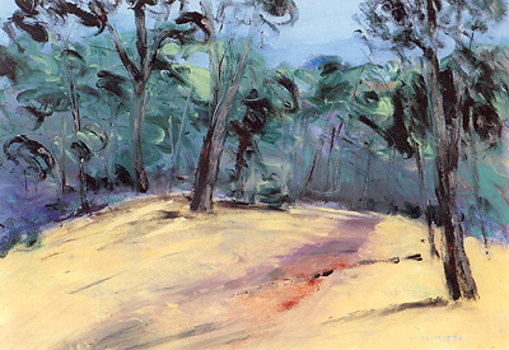 Landscape painting of a pine in the Australian bush landscape. 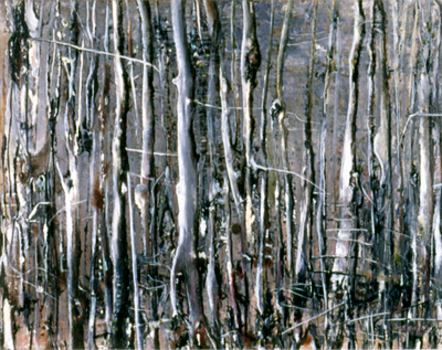 Painted just after the devastating Victorian bushfires of 1962. 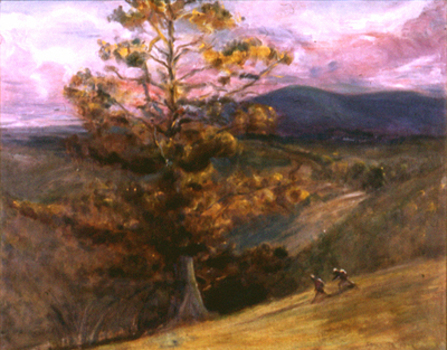 Two figures run down the hill in the foreground. There are hills in the background and the sky is shades of pink and violet. Painted in warm earth tones in a painterly, tonal realist style. Oil on linen, seascape painting. 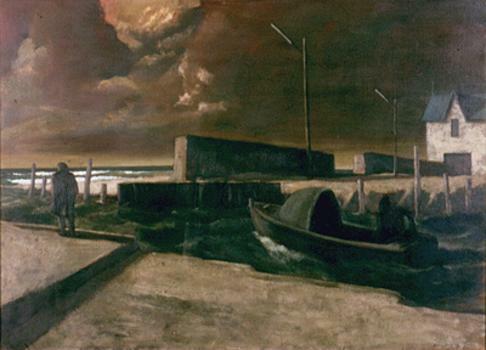 A solitary and motionless male figure in an overcoat stands at the edge of a dock/jetty with his hands in his pockets looking out to sea with his back towards the viewer. A motorised boat is moored close by and a white house with a blue roof can be seen in the distance. The figure is engulfed by the landscape and a resounding sense of desolation. A storm is brewing; the mood forecast by dark, heavy and thick ominous clouds, alternately darkening with the approach of night, a polluted haze and rough seas. 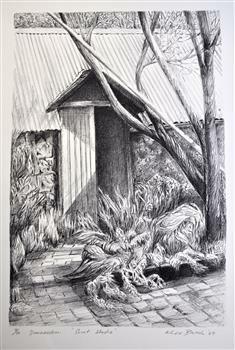 Rick Amor was a good friend of three times Archibald Prize winner Clifton Pugh, living and working at Pugh's artist colony Dunmoochin, (Cottles Bridge) during the 1980-1990s. Amor made frequent outdoor painting trips with Pugh. His studies of Williamstown and areas around the port fuelled a period of sustained painting in his studio at Dunmoochin. Amor is an artist of national significance who had lived locally in Dunmoochin (Cottles Bridge) during the time of this work's making. 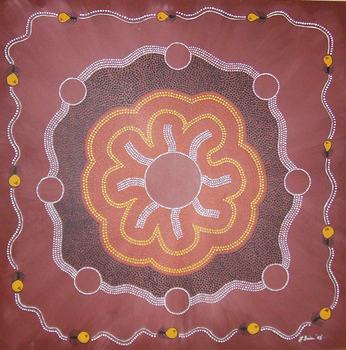 This painting was exhibited/entered into the 1993 Shire of Eltham Art Awards. 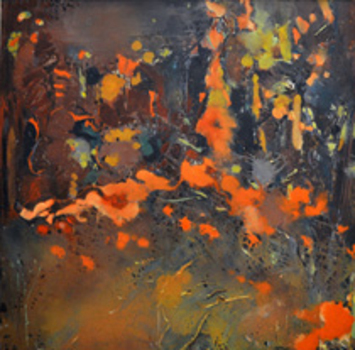 The work is representative of Amor's style and interest in seascapes as subject matter. 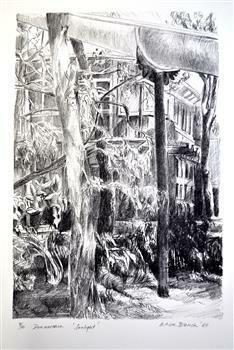 Lithographic print in black and white depicting the Print Studio at Dunmoochin. Alice Blanch Chehovski was born in Queensland to a Russian mother and Polish father. When her father died leaving three small children to bring up on her own, her took them back to Russia to visit her own parents. In the following fateful year, Stalin came into power and the family was trapped by Russia closing its borders. 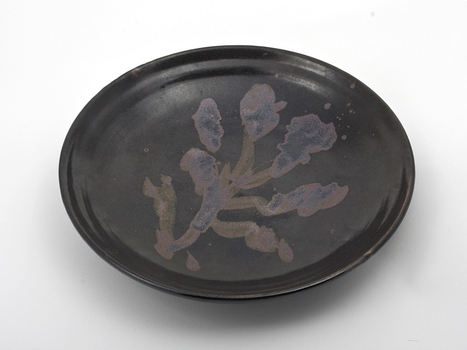 At the age of twenty three, 1944, Alice entered Moscow's Institute of Decorative Arts and Applied Arts to study ceramics. 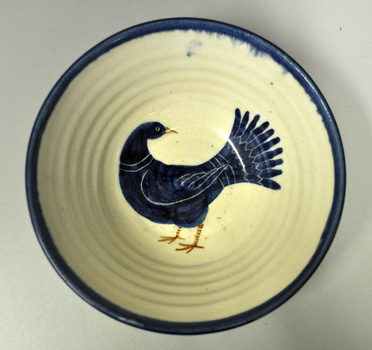 Neither the subject of ceramics nor the academic drawing in fine pencil inspired her. At that time Moscow was surrounded by German troops, Russian culture was inhibited by the war and generally speaking it was not the time for arts. Alice said 'My soul and my hands were needed as a volunteer, to help the wounded soldiers survive'. Alice struggled through a lifetime of hardship and triumph before returning to her native land of Australia in 1981 at the age of 60. 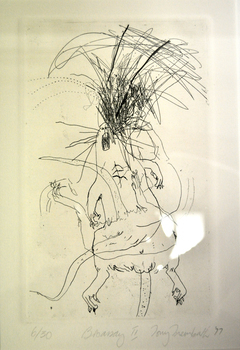 This lithographic print is one of a set of ten produced at Dunmoochin at the time of Clifton Pugh. 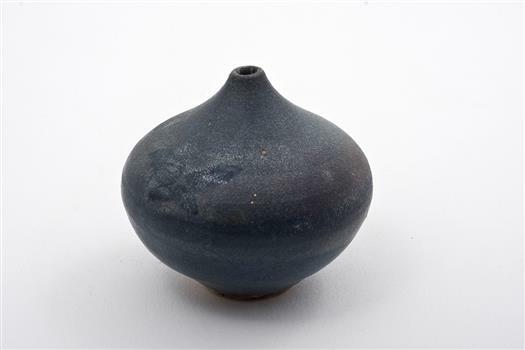 Ceramic stoneware vase, reduction fired, cobalt/copper glaze / 'Bud vase' is a circular, squat vessel decorated with attractive cobalt carbonate mixed with copper / The result is a stunning range of blues, ranging from turquoise to cobalt which seem to stain the exterior and form an orange peel-like texture which is neither glossy nor matte / The use of copper in glazes has been found decorating ancient Egyptian fainece ware and ancient Islamic pottery. 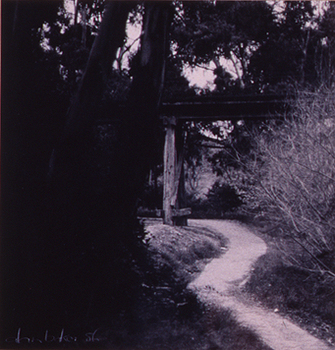 Elsa Arden was one of the founding members of Potters Cottage / Potters Cottage was established in the late 50's in Warrandyte as a co-operative / The artists built a studio, gallery shop and restaurant to experiment, make, promote and sell predominantly domestic wares of the time, which helped sustain each member's practice both financially and creatively / Potters Cottage was influential in the development of contemporary ceramics, building and developing a school that experimented with traditional ceramic processes and raw materials, as well as promoting the use of local clay. Elsa Arden (1917-2006) concentrated mainly on producing tableware (cups, mugs, plates, jars and vases) made with clay sourced locally, particularly from Kangaroo Grounds / Her design approach and ceramic process was very inventive / She would often experiment with her own sourced wood-ash glazes and use seaweed and gum leaves when raku firing / "I enjoy collecting my own materials for bodies and glazes." 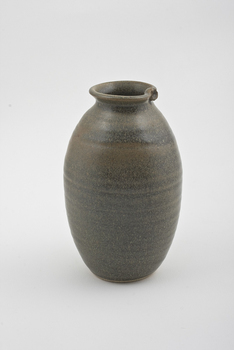 / Ardern's outside glaze receipes were influenced by the great British potter Bernard Leach who himself was influenced by the great Japanese potter Shoje Hamada. 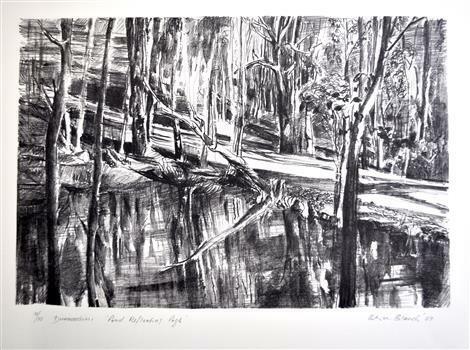 Lithographic print in black and white depicting bushland and a pond reflecting light. Black and white lithograph on paper depicting the elaborate stone and wrought iron (open) gate/ entrance to Pugh's artist colony 'Dunmoochin' situated at Cottles Bridge. 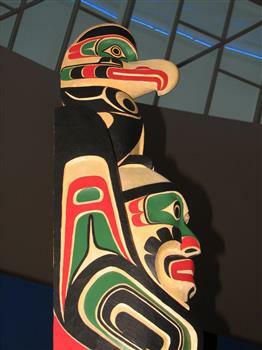 Carved in cedar wood, this totem pole incorporates bold cuts and colours (such as red and green) offset by strong black. 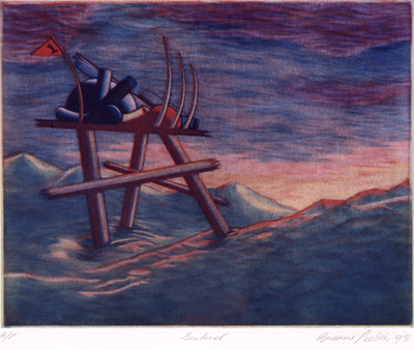 A relative degree of realism is used to depict the alligator located on the bottom of the pole, a man and a 'thunderbird'/eagle located on the top. With protuding element. Wayne Alfred is a member of the Namgis Tribe of the Kwakwaka'wakw people. As a master carver he has an extremely high level of carving skill and knowledge about his peoples cultural objects, customs, tribal stories and legends. The Totem Poles of the North Pacific Coast in British Columbia and Alaska are traditionally carved out of red or yellow cedar, which has a spiritual and practical purpose. 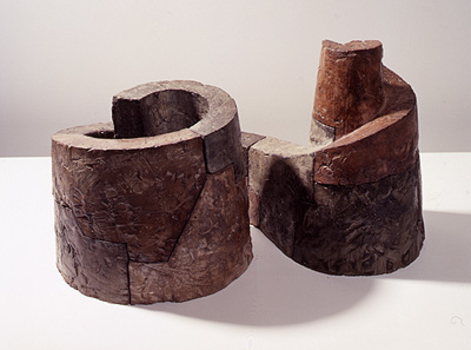 The wood was known for its durability, its resistance to rotting and the inner bark was utilised in ropemaking, clothing, hats, baskets and so forth. The Kwakitul People consider the cedar tree to be among the most sacred of all things provided by the Creator. They believed the Cedar tree to be the axis of the world and a pathway to the upper world. 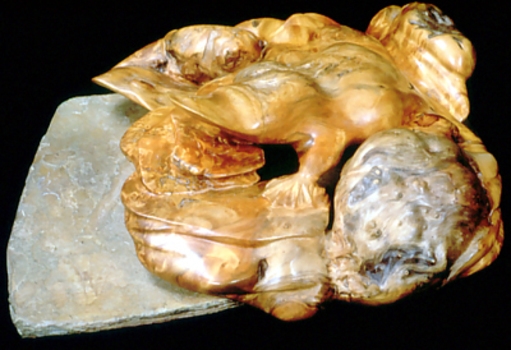 The wood is shaped using implements such as adzes, axes, chisels, carving knives, and chainsaws. Misinterpreted as Gods and idols to be worshipped, totems usually serve six purposes, such as a house pillar for support, a memorial or mortuary pole to commemorate (and house) the deceased, a potlatch pole (used for important traditional indigenous celebrations), a ridicule pole used to shame and a heraldic or family crest pole. Characters and symbols on these totem poles usually display family crests, history, wealth, social rank, inheritance, and privilege, as well as animalistic imagery derived from native animals and mythological creatures. Their sequence are indicative of past family events, ancestors, myths, and heraldic crests, with the bottom figure usually being the most prominent. 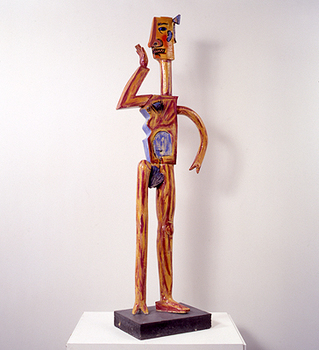 In this work the 'thunderbird' is symbolic of power, strength and of ancestory. The Commonwealth Games Totem Pole was presented to the people of Nillumbik on behalf of the Canadian Government in recognition of Nillumbik as the hosts of the Canadian Commonwealth Games Team in 2006. No inscriptions. Bold cuts used to outline the characters and symbols as well as decorative and stylised features all over the pole. collage; fabric on board. A flock of birds (galahs?) 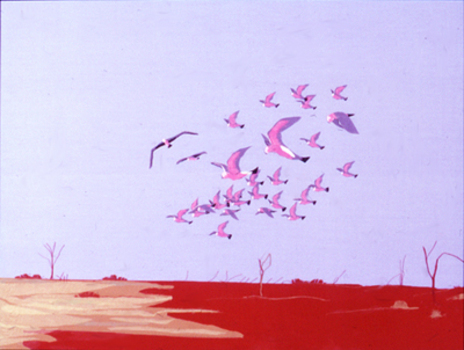 in colours of pink, purple and white fly above the dry barren (red) landscape. Low horizon line and vast open purple, blue sky. Signed lower right corner "Munro", not dated. 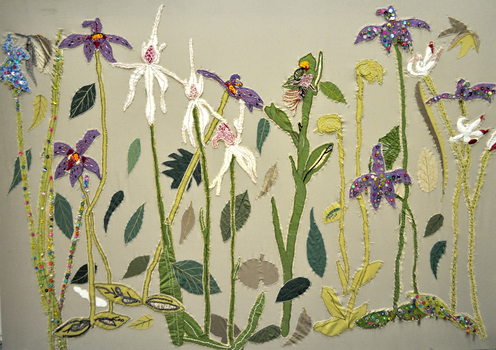 Johnson undertook this project with a State Library of Victoria 'Creative Fellowship' in 2012, drawing on early botanical illustrations by Sydney Parkinson, Pierre-Joseph Redoute, Ferdinand Bauer and others from the Library's 'Rare Books' Collection. 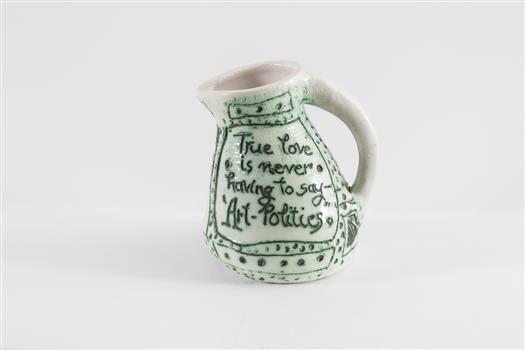 Johnson printed this series in 2013 while working as artist in residence at Baldessin Press, St. Andrews. 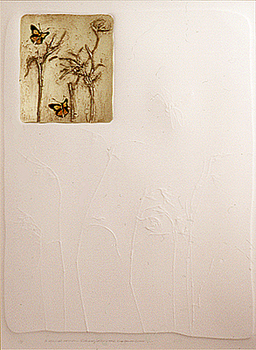 'Voyages Botanical' celebrates the untamed treasures of Australia’s (Nillumbik) vast native flower garden. 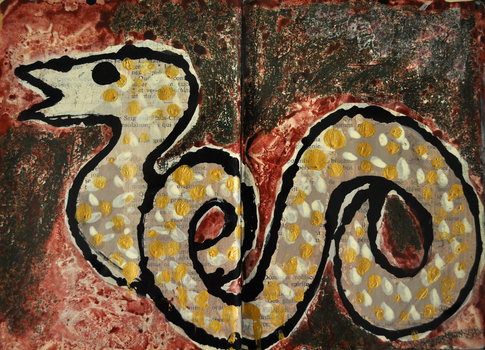 The work speaks to Nillumbik's natural environment and colonial heritage in the context of our national story. Charcoal solander box with artwork title, artist name and flower motif in silver lettering bottom centre. 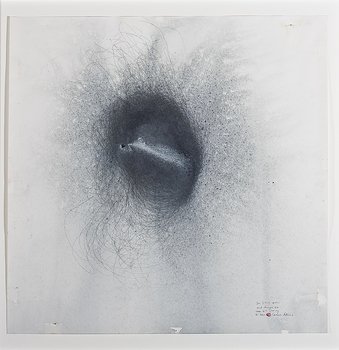 Solar plate engravings x 30: Series A, B: all prints have edition number '4/12' to bottom left of image, artwork title () centre and artist signature 'Christine Johnson 2014' to bottom right of image. Series C: all prints have artist initials signed 'CJ' bottom right of images. All inscriptions in pencil.